With Charlie Wyke and Jerome Sinclair on the treatment table, Ross is desperately short of options. However, any addition will have to compete for regular football when that duo is fit and Ross also has Josh Maja, who has found form early in the season. 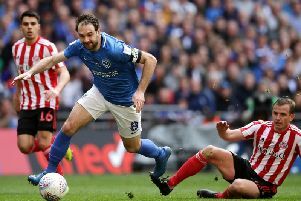 That is leaving some clubs and players in doubt as to whether a switch to Wearside is the best option. Nevertheless, the Black Cats boss is confident that he will get another addition and thinks there is a chance, albeit very slim, that he could have one in time for the visit of Sheffield Wednesday. "We’re still trying," Ross said. "I’ve been conscious of the balance as I said, about who we get in and the balance of the squad. Maybe I’ve been a little too transparent because I’ve maybe made it clear to other clubs. "But I think it’s important to do that, some clubs and players are happy with that, others aren’t. It’s an ongoing process, I’m hoping by the time I finish today I might have an answer from one either way. "Ideally yes [before Sheffield Wednesday]. We've asked the question on one. At the moment I'm planning no, in which case we'll have to be creative because we've only got Josh and I need him for league games. "We've got away with it so far." Ross was also eager to praise those who have helped to fill the attacking void during his tenure so far. He said: "It's important to make clear that sometimes it can be made as a dissatisfaction with what you've had and who you've been playing. "It's far from the case. You couldn't ask any more from Josh, Chris has been asked to play almost as an auxiliary striker and has done really well, as have the midfielders in forward areas. "It is more your options to change the game. We had to shuffle things around to try and keep a forward threat while players were fatiguing and tiring. That can restrict your ability to change the game."